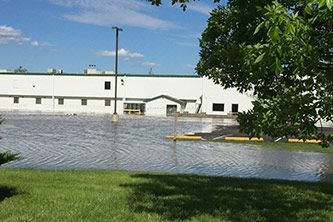 Continuous torrential rain from April 28 through May 1, 2017 in the St. Louis, MO area caused heavy flooding to a 350,000 square foot food packaging facility in Pacific. The repairable contents were kept in storage pods to remain onsite. Bobcats were used to move the unsalveageable contents. All storage and locker systems that could be saved were also relocated to a staging area for cleaning. Commercial negative air units and commercial dehumidifiers were used to remove the moisture and dry out the contents and structure. While performing demolition of built-in casework that was damaged by the floods, unexpected mold was discovered. CSM removed the drywall, performed structural drying and cleaning, and completed encapsulation of masonry walls. Containment of 127-linear feet was built for the drying and encapsulation process to maintain a clean environment. The team also removed the vinyl (VCT) tile and performed demolition of the raised subfloor in two of the entrance areas. Throughout the process, CSM worked around the clock for entire weeks until the project was completed. 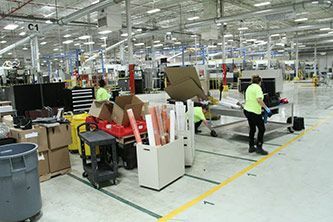 They overcame all challenges, including completing substantial work within just one week, and keeping all areas food-grade clean since the client produces packaging for food consumables.